Remember this? Flickr folk let loose in the London Transport Museum with cameras a-go-go? Well, true to their word, the best 5 Flickr pics now adorn the Museum's website. Featured in there are a couple of Londonist Flickr pool favourites, including Chutney Bannister and Phill Price. Hooray! See more of the photos from the Flickr London Transport Museum meet here. Thanks to Annie Mole for reminding us about this excellent initiative! 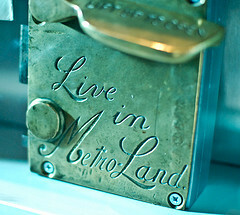 Metroland, one of the winning images - close up of a door handle on a train carriage - by Meg Pickard.